You may wish to see an introductory page to this section with a map or page one first. 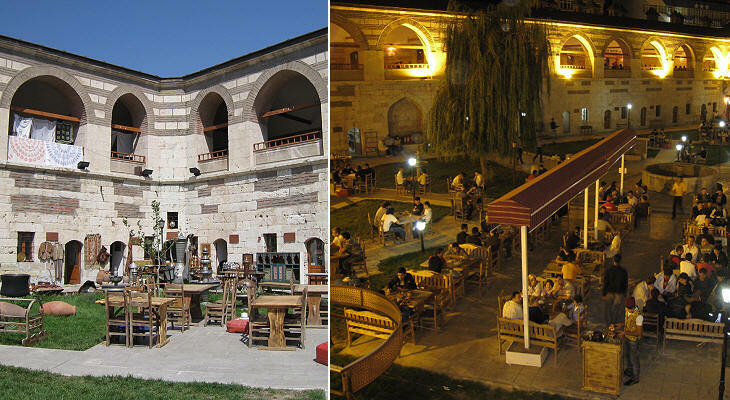 "The Gok (blue) Medrese" of Turkey is no doubt that of Sivas, yet that of Tokat deserves a visit. 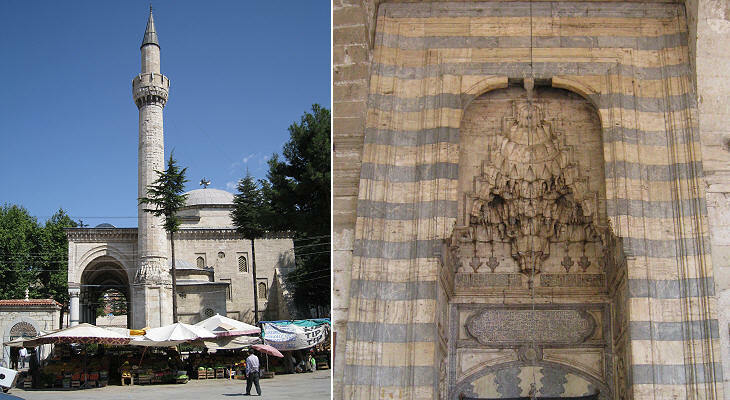 From the exterior one would rather call it Kizil (Red) Medrese for the colour of the stripes which decorate its façade. It was built between 1271 and 1277 next to a dervish lodge and it marked the development of a new city centre after the construction in 1250 of the bridge across the Yesilirmak. The appropriateness of the name is evident inside the building because the whole courtyard was decorated with bands of blue tiles. The remaining ones show three recurring motifs: flowers, stars and calligraphy. The image used as background for this page is based on the star motif. A zaviye is a monument incorporating the place where a holy man both lived and was buried. This zaviye however is named after the civil servant who built it in 1291. 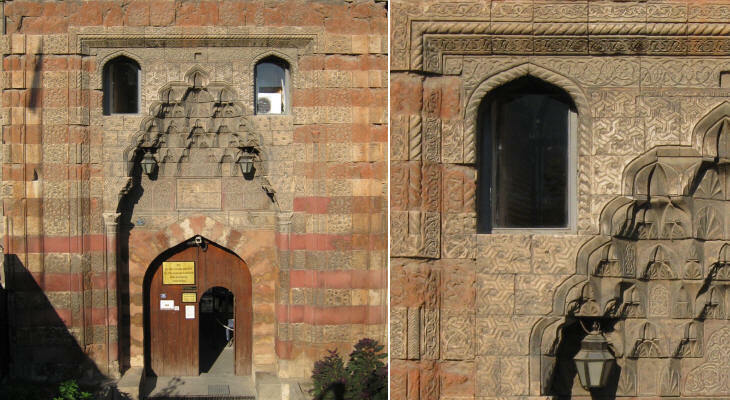 It is located in the vicinity of Gok Medrese and the design of its portal is similar. Its domed chambers served as tombs. Abdallah Ibn Haji Sunbul was a freed slave who founded a dervish lodge. Baba is an honorific that denotes an elderly man, someone who can be trusted for advice and in some instances a holy man. This zaviye was built in 1291. Gulbahar Hatun was the mother of Sultan Beyazit II. She belonged to a noble Greek family. The sultans were very devoted to their mothers. This is true for most people, but in the case of the sultans they had more reasons than others to thank their mothers. The Ottoman line of succession to the throne can be summarized in just a sentence: it was up to the reigning sultan to appoint his successor: he could choose at his will among his many sons; because very often the new sultan had his brothers strangled on the very day of his enthronement, being the selected one was a matter of life or death. The wives of the reigning sultan made all efforts to influence his decision in order to secure the accession to the throne to one of their own sons. 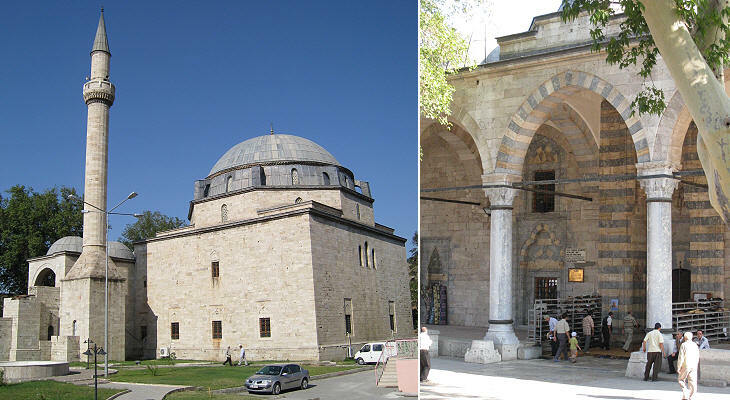 The mosque was built by Sultan Beyazit II in 1485 and it was dedicated to his mother (hatun=lady/wife). In other instances the title given to Gulbahar Hatun was Valide Sultan (Sultan's Mother). 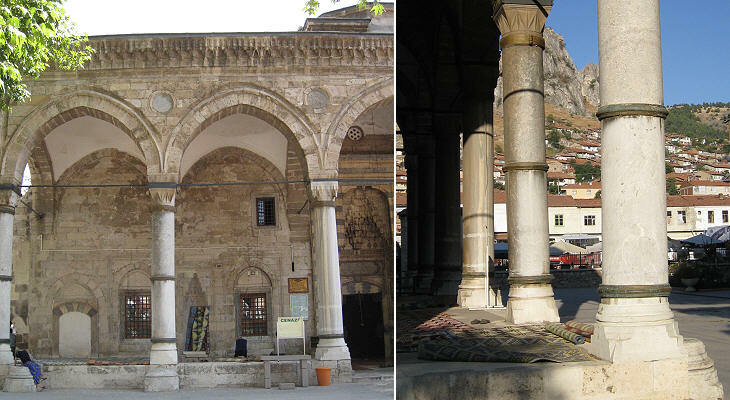 The portico of the mosque was built making use of ancient columns and its design is reminiscent of Italian Renaissance. 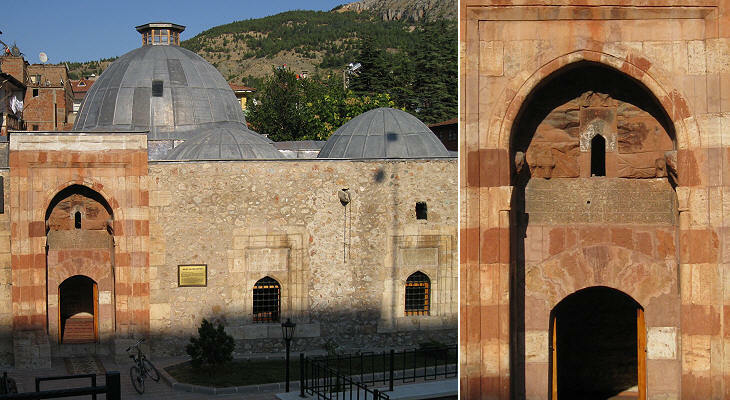 A second large Ottoman mosque was built in 1572 by an Ali Pacha who was the son-in-law of Sehzade (Prince) Beyazit, son of Sultan Suleyman. This mosque has a very fine portico. 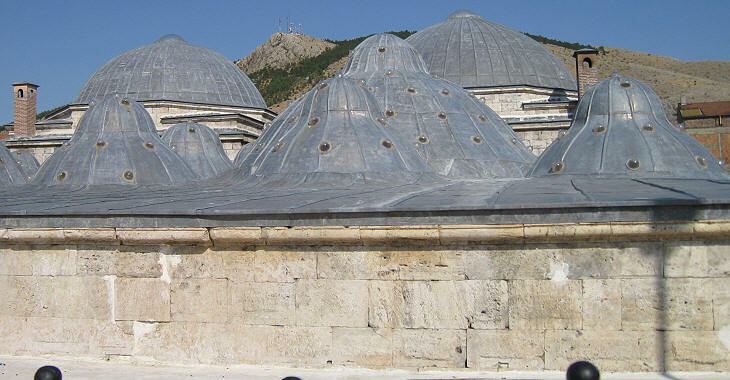 The mosque was part of a kulliye, complex of buildings, one of which was a hammam. It is characterized by many small domes of a very unusual shape. Tas (Stone) Han was a caravanserai which was built in ca. 1630 along the north-south road. It has been converted into a busy shopping centre. Its large courtyard houses several cafés and restaurants. The photos above were taken in 2008 during Ramadan, the ninth month of the Muslim year during which strict fasting is observed from dawn to sunset. 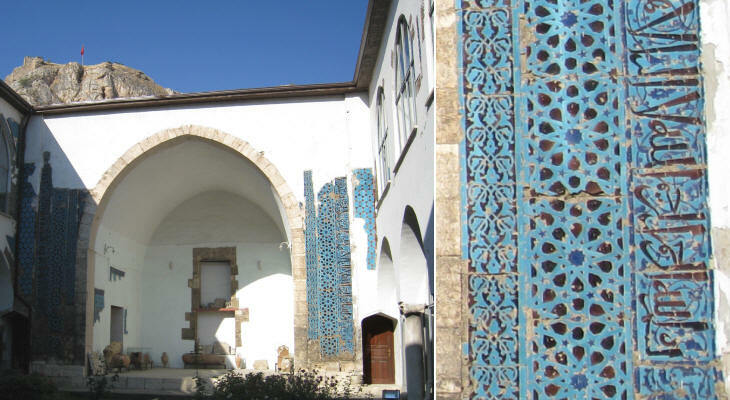 Latifoglu Konagi is a XIXth century Ottoman house which has been restored and converted into a small museum showing traditional furniture and equipment. 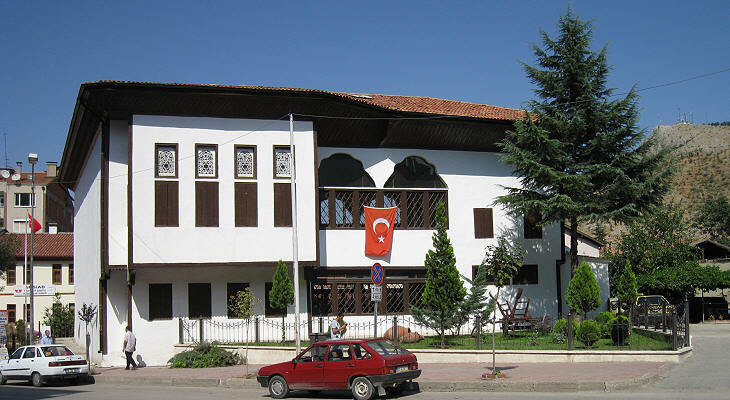 You may wish to see more examples of traditional Ottoman houses at Safranbolu.